Learn to knit lace in easy steps with Anna Nikipirowicz’s step-by-step tutorial! Lace knitting is created by series of increases and decreases that make beautiful open-work patterns. Lots of people get quite daunted at the prospect of knitting lace as they see it as a big challenge, and often rather difficult – however, a delicate piece of lace knitted in gorgeous yarn is worth the challenge and taken slowly can be a very satisfying knit! Also, not all lace projects are difficult, and the best way to learn is to start small and progress to more difficult projects. In this tutorial, I want to take you through all the increases and decreases used in lace and start you off on two simple lace swatches. After that, I’ll tell you about blocking, which is vital for finishing your lace projects – this will take your lace from great to stunning! I’m using Paintbox Cotton DK yarn and 4.00mm (US 6) knitting needles. An eyelet is made by wrapping the yarn around a needle, which makes an extra stitch. There are four ways of wrapping the yarn around the needle, each way is slightly different depending on whether the stitch before and after is a knit or purl. In American patterns the term yarn over (yo) describes all of these methods, however in UK, different terms are used to indicate these increases. Yfwd – Yarn forward – used when you have just worked knit stitch and need to do another knit stitch after the yarn forward. Bring yarn forward in between needles and knit the next stitch with the yarn going over the right-hand needle. Yon – Yarn over needle – used when you have just worked purl stitch and the following stitch is knit. Put the tip of the right-hand needle knitwise into the next stitch, as the yarn is already at the front it will automatically go over the needle as you knit the next stitch. Yfrn – Yarn forward around needle – used when you have just worked knit stitch and the following stitch is purl stitch. Bring the yarn forward between the needles as if to purl, wrap the yarn once over and around the needle until it is back in the right position to purl the next stitch. Yrn – Yarn round needle – used when you have just worked purl stitch and wish to do another purl stitch after the yarn over. Take the yarn over the right-hand needle to the back of work and then through between the needles to the front of work, purl the next stitch. To keep the number of stitches consistent in your work, decreases are worked before or after an increase. There are different types of decreases, depending on which way you want the stitches to slope in stocking stitch – this is important in mirroring decreases for neatness. The two below are the most common decreases, you simply knit or purl two stitches as one. Skpo – slip one stitch, knit one stitch, pass the slipped stitch over the knitted one. This is quite a prominent decrease, very often used in the leaf designs. Ssk – slip, slip, knit – slip the first and second stitch knitwise on the right-hand needle, insert the left-hand needle into the fronts of these stitches and knit them together. This technique produces a less noticeable decrease than skpo. The two decreases below are very similar to k2tog and p2tog, but you are knitting and purling through back loops of the stitches, which causes the stitches to slope to the left in stocking stitch. K2tog tbl – knit two stitches together through the back loop. P2tog tbl – purl two stitches together through the back loop. Lots of lace patterns are often illustrated in charts rather than written instructions, however sometimes patterns will have both. The key to the chart will always be next to it and it is important to familiarise yourself with it before you start knitting. 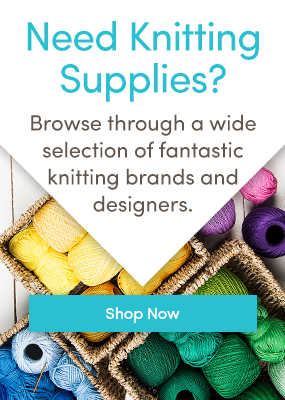 Make sure you know how to work all the techniques needed before you start the project, and, if necessary, practise any unfamiliar techniques with scrap yarn – it will save lots of unravelling and damaging your lovely yarn you have for this project! When starting your first lace project, choose a pattern where every alternate row is a plain knit or purl row. This will make it easier to unravel and fix a mistake, and it’s just nice to do an easy row after concentrating so much on the lace pattern – I always call it a rest row! Tip: use the LoveKnitting app to keep track of your pattern row by row! When working in rows from a chart you start at the bottom right corner and work from right to left on right sides and left to right on wrong sides. Each square on the chart represents a stitch and each horizontal line of squares a row of knitting. The numbers on the side indicate the row numbers, the wrong side rows are on the left and the right side rows are on the right. The numbers at the top and bottom indicate stitch numbers. Rather than displaying the full charted design patterns will give you a section that needs to be repeated: this is called a pattern repeat. If you look at the chart below, there are two edge stitches on either side worked in garter stitch: you work the two edge stitches, then work the 21 stitch pattern repeat as many times as you need and then work the two last edge stitches. For both the sweet heart and single diamond charts cast on 25 sts and follow the chart. If you would like the sweet heart design larger, just cast on more stitches in multiples of 12 for each pattern repeat. I have also written out the sweet heart pattern just so you can familiarise yourself with a written version of a chart. Why not try teaching yourself how to work a chart by reading half the rows from chart and half from the written version? Make sure you familiarise yourself with the key first. You will notice that both charts have two-stitch decrease techniques, they very similar to each other but give slightly different finished effects. Row 2 and all WS rows: K2, p21, k2. Row 3: K10, k2tog, yfwd, k1, yfwd, sl1, k1, psso, k10. Row 5: K9, k2tog, yfwd, k3, yfwd, sl1, k1, psso, k9. Row 7: K8, k2tog, yfwd, k5, yfwd, sl1, k1, psso, k8. Row 9: K7, k2tog, yfwd, k7, yfwd, sl1, k1, psso, k7. Row 11: K6, k2tog, yfwd, k9, yfwd, sl1, k1, psso, k6. Row 13: K5, k2tog, yfwd, k11, yfwd, sl1, k1, psso, k5. Row 15: K4, k2tog, yfwd, k13, yfwd, sl1, k1, psso, k4. Row 17: K3, k2tog, yfwd, k15, yfwd, sl1, k1, psso, k3. Row 19: K2, k2tog, yfwd, k7, k2tog, yfwd, k8, yfwd, sl1, k1, psso, k2. Row 21: K2, sl1, k1, psso, yfwd, k6, k2tog, yfwd, k1, yfwd, sl1, k1, psso, k6, yfwd, k2tog, k2. Row 23: K4, yfwd, sl1, k1, psso, k3, k2tog, yfwd, k3, yfwd, sl1, k1, psso, k3, k2tog, yfwd, k4. Row 25: [K5, yfwd, sl1, k1, psso, k1, k2tog, yfwd] twice, k5. Row 27: K6, yfwd, sl2 as if to k2tog, k1, then pass 2 slipped stitches over knitted one, yfwd, k7, yfwd, sl2, k1, p2sso, yfwd, k6. Row 28: K2, p21, k2. Blocking is the term used to describe the process of finishing your project by washing, wetting, steaming and drying your knitted pieces. For lace projects blocking is vital as this is what will open the pattern and make the lace bloom. It also evens out the stitches and can help disguise a multitude of sins! I’ll write a bigger blog post covering all blocking methods, but for now I would like to cover the steaming method. With such small swatches in cotton yarn, steam blocking is a perfect choice – however for lace shawls wet blocking is always best. Pin the swatch on a towel so that all edges are even. If the final measurements of the swatch were important we could use a measuring tape to make sure all sides are the correct size. Place a clean dry or damp cloth over the swatch then hover over it with an iron at the recommended temperature making sure that the steam passes through to the knitted fabric. NEVER place the iron directly on the knitted fabric as it will crush the yarn. Let the piece rest and dry before unpinning. Share your lace projects with the Community here! Last updated: May 31st, 2017. This is the first explanation of reading a chart that I have been able to follow, understand and implement. Thank you so much! I have been wanting to learn lace knitting and have been put off by reading the chart; now I’m about to jump in. Thank you. Thank you so much for your lovely comment and I’m so glad I was able to help you understand charts better. I think there is a typo in the sweet heart casting on instructions. As it is published it reads – If you would like the sweet heart design larger, just cast on more stitches in multiples of 12 for each pattern repeat. I believe that the number of stitches should be multiples of 21. It’s easy to mistype the numbers, as I was typing this, I also typed in 12 ! You are completely right, it should be 21 sts. Thank you so much spotting it.